Over 600 million people are now on Instagram. This creative, visually-led social network is rapidly becoming a place where people hang out online, engage with brands and find content to share. Many B2B companies dismiss Instagram as not being right for their brands. Instagram doesn’t immediately spring to mind when you think of B2B marketing. It doesn’t drive traffic to your site or allow for links to your products or latest blog posts. But there are huge opportunities to promote your brand values. Meaningful brands need to stand for something above and beyond their products or services. Specifically, only brands that ‘mean something’ will survive. As with every other social channel you’re using to promote your brand, you’re going to have to create a specific strategy. B2B brands need to embrace the fact that marketing on Instagram is less about selling the benefits of your products and services, and more about establishing deeper connections with people including industry thought-leaders, employers, and prospective clients. Building and maintaining awareness of your brand needs to come before lead generation. Think of Instagram as a way to grab the attention of industry influencers and prospective clients at a time when they’re not in ‘work mode’. B2B companies can have success on Instagram by behaving more like humans and less like companies. They need to focus on specific ways to humanize their brand. Give people an insight into your B2B company culture using Instagram to offer a behind the scenes look at your company. People are, generally, a bit nosy and love seeing what goes on in other people’s offices. Showing people that you’re not stuffy, that you’ve got nothing to hide, humanize your brand. It can be as simple as weekly ‘beer-o-clock’ or taking photos of one of your company’s birthday. Whatever behind-the-scenes update you use, don’t worry too much about them seeming unprofessional; B2C brand’s social media channels thrive on being relatable and yours should too. Highlighting other businesses and entrepreneurs also makes you look good; it gives the impression that you’re creating a movement around your brand as opposed to being in a constant ‘selling’ mindset. Having an established identity for your brand is the most effective way to find your voice and gain followers. The fastest growing demographic on Instagram is in the 30-49 demographic – So even if your customers aren’t using Instagram through a business account, chances are they are there. Storytelling has become a great way to give B2B brands a personality. It’s about connecting with your audience and moving away from the self-centered, sales-orientated advertising that just doesn’t work for B2B brands anymore. The key to leveraging Instagram as a marketing tool for B2B brands is not to think of it as a marketing tool at all. Instead, you want to think about Instagram as a way of telling your story as part of a larger marketing strategy. 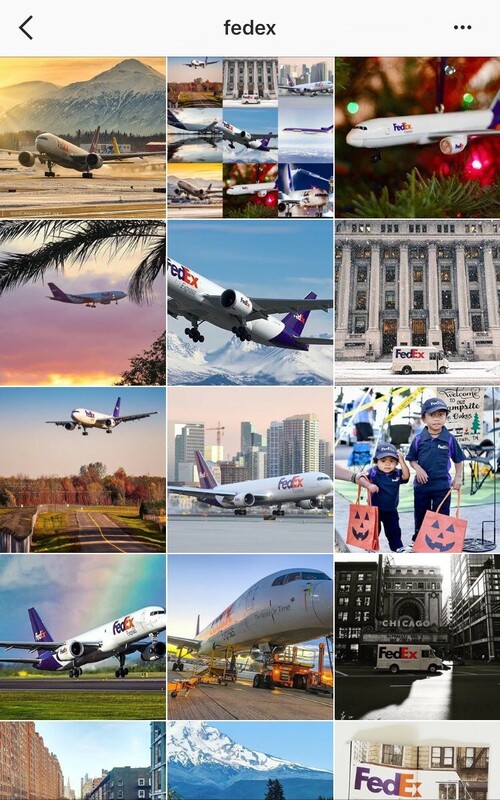 Their feed gives the impression that FedEx is always moving, always delivering, always there. And for businesses who rely on deliveries, being on time, that’s a really important message to be able to take away. Use bright, colourful images to show its followers what goes on behind the scenes at its offices. 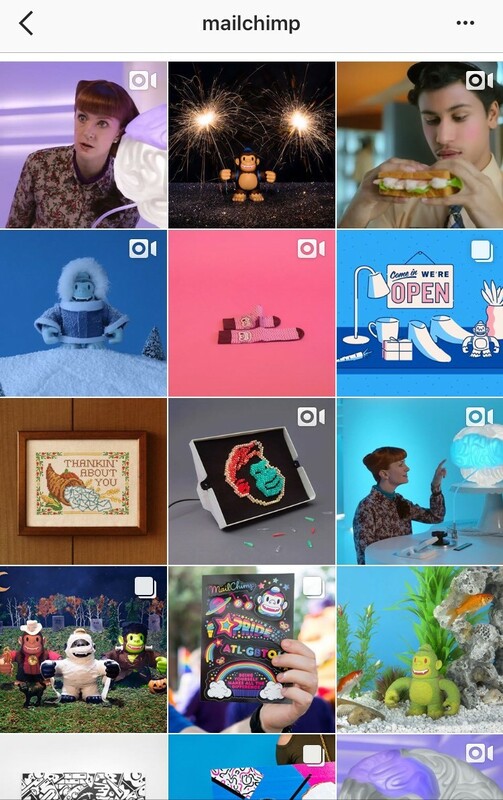 In all of its Instagram posts, Mailchimp represents an image of itself as a company filled with people who are curious and happy. – The first being that you wouldn’t immediately think of either having an Instagram presence. – They both have clearly defined strategies to their presence (FedEx = Brand Affinity, Mailchimp = Relationship building). Meaning that these accounts are purposefully posting photos to enhance a certain aspect of their business and brand. Instagram is not as straightforward as Twitter or Facebook, where you can simply share relevant content with your industry and get clicks back. It requires a bit more patience and creativity. You need to be much more expressive. Your followers will want to feel like they have something in common with you. We set up our own Instagram here at Sendmode, follow our journey @Sendmode.